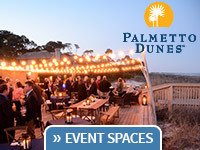 From the most intimate gatherings to the grandest of galas, Hilton Head Island is prepared to meet your banquet needs! Discover the culinary delights that await you and your group at Hilton Head Island’s hospitable banquet facilities and choice hotels. Whether you’re planning and intimate breakfast for 10, a casual barbeque for 100, or a gourmet banquet for 1,000, Hilton Head Island’s award-winning catering and culinary staffs will help create the perfect event.